Digitalization creates unique opportunities and poses transformational challenges for many companies across industries. In that context, the governance of digitalization has become the key success factor in mastering digital innovation and transformation. It requires boards of directors as well as top management teams to fully understand digital trends, identify their implications, derive adequate digital strategies, execute them swiftly, and monitor their diligent implementation. 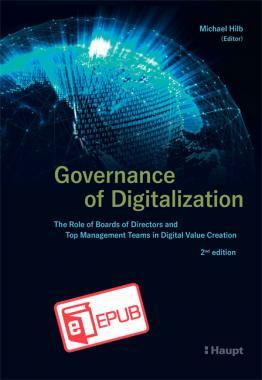 This book presents 12 perspectives on the governance of digitalization, bringing together viewpoints from different disciplines, including business, law, and information technology, with contributions from practitioners and academics. It provides practical insights and thought-provoking inspirations for board members and managers alike. Prof. Dr. Michael Hilb is Vice President, Group Strategy and Digital Business at DKSH, a leading market expansion services company with focus on Asia, overseeing its international digital business operations. He is Titular Professor at the University of Fribourg, Switzerland, lecturing strategy, entrepreneurship, and digital business at universities in Europe and Asia. He is a member of the Board of Trustees of the Board Foundation, a not-for-profit organization committed to advancing the state of corporate governance research, practice, and education, and a member of the Advisory Board of Code_toGo, an educational platform for the development of future digital leaders.